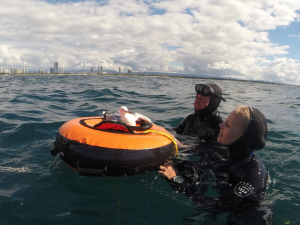 We aim to give reliable and honest information regarding water visibility during freediving courses and freediving training sessions and diving conditions on the Gold Coast – primarily of offshore diving conditions (#unfiltered #real&reliable). Offshore is where we specialise and develop you as an ocean freediver. Regrettably, we do get busy and don’t get time to update this section of the website as often as we’d like (volunteers, anyone?) 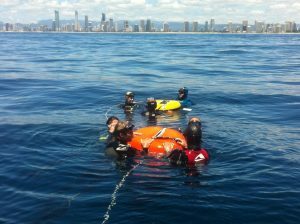 Important to note: We run freediving courses regularly but we rarely run freediving courses in the Gold Coast Seaway (unless we’re desperate) as conditions are far, far more favourable to dive offshore – with less current, better dive window for you, little boat noise / traffic and far, far greater visibility and, generally, safer all round. 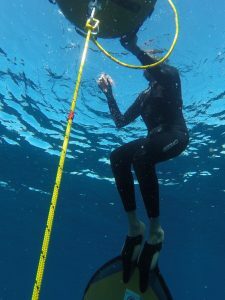 As far as freediving courses are concerned, your real freediving action is happening offshore – poke about in the Gold Coast Seaway – but only if you have to (remember to take a good dive flag with you, hug it closely, and have a shore-based lookout to ward off the boat and jetski traffic). To get a good indication of predicted water temperatures please click on Gold Coast Monthly Sea Temperatures. On average, Gold Coast water temperatures reach a minimum of 19 degrees centigrade in July/August and a maximum of 27 degrees in February. We were a little unsure about diving today because of predicted weather conditions but we had two very keen Assistant Instructor students (Jack and Jono) urging us to go out so what the heck. We were glad we did as we were met with some 25 metres visibility. Water temperature was still around 26 degrees centigrade. It was choppy in the boat with SE winds from 7 knots at 7am but up to 14 knots at one stage with a 1.4 metre swell. Neertheless, the choppy conditions did not affect dive preperation on the surface and overall they were very comfortable diving conditions. Absolutely amazing conditions today with 22 metres visibility at the 36m depth contour. We knew we were in for a cracker of a morning when we took our lifejackets off just outside the Gold Coast Seaay. We could easily see the bottom in about 8 metres depth We were blessed with flat seas (Burea of Meteorology stated 0.8 metre swell), almost no wind (under 5 knots) and a very comfortable temperature of 26 degrees centigrade at all depths. All pics on Facebook. Our first day back out after Cyclone Oma. We headed out to our usual dive site at the 30 metres contour but had significant current. so after about 30 minutes of diving headed into shallower water of 22 metres depth. Here we had no current at all. Visibility was about 8 to 10 metres with a water temperature of 26 degrees centigrade. We manged to get out and celebrate Australia Day diving at the 32 metre contour. Water visibility was improving at about 12 metres from the surface though a bit hazy down at 30 metres. But the big plus was finally the warmer water conditions had arrived with 27 degrees on the surface and 25 degrees at 30 metres. Wind was a low 3 or 4 knots at 7am but picked up to about 11 knots by 11am. Overall, a great day of freediving with 7 freedivers in the water enjoying the summer conditons. Full pics on Facebook as usual. This was our Deep Dive Day for advanced freedivers. We were diving from 40 to 45 metre depths. Water and visibility conditions had been atrocious with an influx of blue bottles some two weeks earlier. Luckily conditions had improved with a minimum of 7 to possibly 10 metres visibility and no blue bottles to be seen or more importantly felt! The water temperature was still surprisingly cold with 23/24 degrees on the surface but 21 degress down at 45 metres. This was compensated by the flat seas and almost no wind. We have missed the last few diving reports. Apologies for this. Today we went out early at 7am to make the most of the calmer conditions. Wind was perhaps about 10 knots at this time but dropped down to 5 to 6 knots mid-morning before increasing again by 11am but we were dived out by then. Visibility was around the 10 to 12 metre mark with some particle matter. Water surprisingly cold for the beginning of December with about 23 degrees centigrade at 20 metres depth. (in fact last week we had an unseasonal 19 degrees at the 20 to 30 metre depth mark). Fortunately warm on the surface with 30 degree air temperatures, blue sky, and gentle swell. Some dolphins swam by some 15 metres away too. Pics as usual on Facebook. Another great dive day. We got out early at 7am to avoid the anticipated increase in winds (which was 30 knots by 6pm) and we were rewarded with 20 metres visibility. 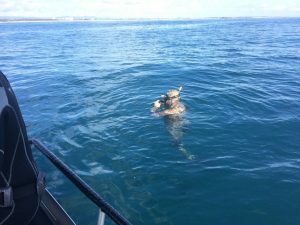 Divers reported the visibility dropped off dramatically at the 20 metre mark but this was only a minor concern to the two 30 metre depth divers. There was also a thermocline at about the 15 metre depth with possibly a 3 degree drop in water temperature. Nevertheless, my dive watch was reporting 23 degrees centigrade at 24 metres depth and 24 degrees centigrade at about 5 metres. Slightly choppy at about 8am but the wind dropped off completely by 10am giving us flat seas again. After some two weeks of wild weather and rain including 4 metre swells the previous Sunday it was good to get out but we weren’t too sure what to expect. We were pleasantly surprised with almost no wind which tended to flatten the predicted 1.2 metre swell. From our perspective the seas were flat. There was no current which made diving from the buoy a pleasure. The million dollar question what was the visibility like? It was pretty good depending on what depth you were diving to. From the surface looking down the line we perhaps had 8 metres of visibility but once under the 5 metre top layer we had vis almost all the way to 20 metres. The two divers who dived to 30 metres reported that it dropped dramatically after that with maybe only 3 to 4 metres vis. The water is getting nice and warm with 23 degrees centigrade. Back to our 3mm open cell wetsuits. Full pics on Facebook as usual. Conditions report. Well, we went out on the Saturday to avoid to winds that were predicted to come up on the Sunday. At 8:30am the offshore visibility was at 15m but slowly declined by midday and a slight chop forming on the surface. Slight current at the 32m depth point but nothing concerning. Sunny skies all day with a water temp (so the dive watch said at 20m) of 19 degrees. Conditions today were great. A full boat – dolphins are getting used to our divers and their curiosity is bringing them over more regularly and they seem to be comfortable just hanging around. 16m+ vis. 19-20 degrees water temp. Calm, calm, calm seas. Mirror like. No wind. Loggerheads around and a few mantas jumping out of the water. Busy floats. Plenty of sunshine and … an Ex Australian Freediving Champion on board – Ben Noble. How do you like that? The Gold Coast’s standard conditions are living up to their usual wonderful winter conditions. Perhaps not the best day for freediving from a boat with 11 to 13 knot winds and one metre swells which for some reason made it a bit jiggly out there and not the best for those prone to sea sickness. Vis was about 13 to 15 metres with water temperatures still at 21 degrees centigrade (which was excellent given some of the recent overnight air temperatures getting down below 10 degrees on the Gold Coast). This was a depth diving day and given that we were diving up to 40 metres in depth we were further out from the coast than usual perhaps exposing us to rougher conditions. Another awesome day freediving with at least 22 metres water visibility, 0.9m swell and very flat/no wind when we first arrived at about 8.30am though the wind picked up to about 8 knots by midday. Water temperatures slowly dropping to about 21 degrees centigrade which was not helped by the cloudy day. 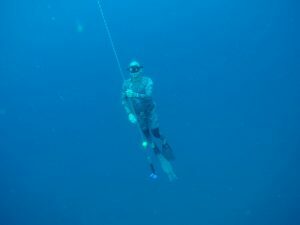 A big plus was the total absence of current which was perfect for freediving on a buoy and line at the 33m depth contour. All pictures on Facebook. We had a great 20 metre visibility, 22 degrees water temperature, 0.6 metre swell and an on average 8 knot westerly wind. All great conditions for freediving. This is what 20 metres water visibility looks like. Very pleasant conditions offshore with maximum south westerly winds of 8 knots and half metre swells resulting in almost flat seas. Water visibility varied from 12 metres when we first arrived to about 16 metres later in the morning (and towards the top of the tide). Water temperature was 23 degrees centigrade. Still comfortable diving in our 3mm open cell wetsuits. The surprise of the morning was a visit by a pod of dolphins which swam by to check us out at several metres below the surface. Conditions were blown away offshore with 20 knot plus winds so we headed inshore to the Blue Lagoon. 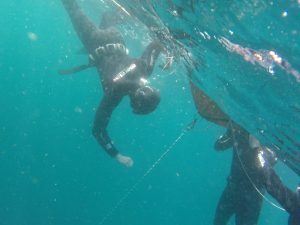 While the water was colder at 23 degrees centigrade, there was no current or wind, and we still had a good 7 metres visibility to finish our course. This photo was taken just below the surface but gives a good indication of visibility. A good 7 metres visibility at the surface as this photo nicely shows. Conditions were awesome to say the least with the best diving conditions of the year with 25 metres plus visibility, no wind and sea temperatures around the 25 degrees centigrade mark. Video of surface conditions and dive photos are on our Facebook page. The improvement in conditions becomes apparent when you look at the pictures from our last dive report. Water visibility looking up from 24 metres to see one diver on the rope at the surface and the outline of the boat to the right. Water visibility at the 16 metre depth mark on Anzac Day. Well finally a break in the seas and we went out to be met with almost flat seas and no wind. It was flat as a millpond on the surface. Visibility was only about 5 metres at the surface looking down from the buoy but some 15 metres visibility once beyond the 5 metre layer of poor vis. Water temperature was about 24 degrees centigrade. Check out Facebook where we have a video of the surface conditions. Probably the best day for going out in the ocean since our last time out on the 4th (though should be good for tomorrow too). The Gold Coast has been feeling the effects of a cyclone some 1500 kms away for the past two weeks. 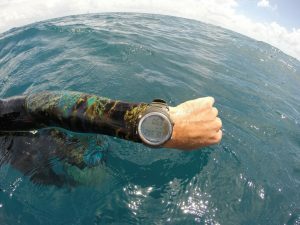 The water was a nice 27 degrees according to my dive watch, winds under 10 knots, and a jiggling one metre swell. Visibility was a nice even 10 metres throughout but some particle matter stopped further visibility (from the cyclone seas stirring things up). We were a bit closer to shore diving on the 25 metre depth contour. Photo taken at about 7 metres depth showing the two layers of visibility. Conditions were much better this weekend compared to last weekend. While a little choppy when we first got out around 8am and some current this settled right down to flat seas and only a slight current at the surface and no current past the 5 metre depth. 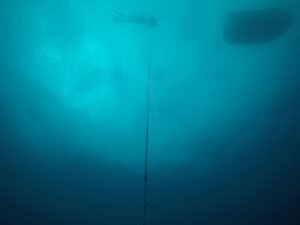 In fact, water visibility was about 10 metres from the surface looking down but when we got past the 5 metre layer the water was really blue to about 15 metres visibility. Depending on rain levels over the next week or two we would like to think this top “dirty: layer will disappear. We were very fortunate in being able to get out on this Sunday despite the previous two weeks of big seas and rain. We had relatively flat seas (1.1 metre swells), manageable winds, mostly sunny, little current in the water, and comfortable water temperatures around 26 degrees. The only downside was water visibility of around 6 to 7 metres. 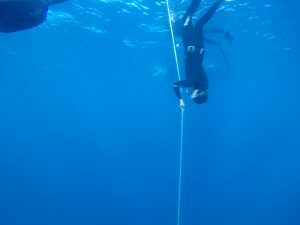 Nevertheless, a big effort by some freedivers including Damian Papworth completing his Advanced Ocean Freediver (AIDA 3 Advanced Freeediver certification) with a number of dives around the 30m depth. With swells of 2.5 metres today no boats were going outside (except submarines) so our course was conducted around Wave Break Island. Unfortunately, there was a very strong current exacerbated by the surges at the entrance to the seaway. In fact, high tide was 10am but there was a only a small window of no current around 11am. Water visibility was also poor with at best 3 metres looking down (with the sun behind me). Far from ideal conditions for a freediving course and which is why we prefer to head offshore whenever possible. Despite the seaway being popular with scuba divers, the best freediving is clearly offshore. Water visibility was about 10 metres today which was slightly unusual as no particle matter and very good until about 10 metres but then just dropped off. 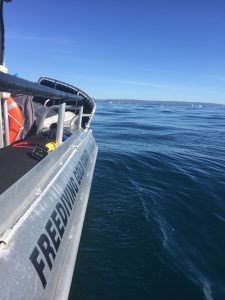 Because of the somewhat lumpy seas caused by the 13 to 15 knot winds we only went out to the 26 metre depth contour – some 3 kilometres out to sea. Nevertheless very pleasant diving conditions with no current and quite comfortable on the buoy with a 26 degrees water temperature on the surface. Jamie McCulley was very happy with his 25.5m constant weight dive. Today was our last AIDA 2 Ocean Fun Day for 2017 and we were fortunate to be blessed with calm seas (apparently 0.5m swells) and almost no wind at 8am though it picked up towards lunchtime. As you can see flat as a pancake at about 8am when this picture taken. Visibility was about 10 metres though improved with less particle matter around the top of the tide (11am). Friday freediving was in full swing this morning with 16 metres water visibility and a more comfortable 25 degrees centigrade water temperature. Diving conditions were very pleasant earlier in the morning but winds started coming up towards the end of the diving. Fortunately, we got out early to take advantage of this window for diving. We expect similar conditions for diving tomorrow. Finally weather and ocean conditions appear to be improving and we expect largely sunny days, and flatter seas by the coming weekend for our Ocean Freediver course on Saturday 9/12/17 and Sunday 10/12/17. Ocean conditions have been poor for freediving since the 18th of November with unseasonal large easterly swells and these are predicted to continue for at least one more week with easterly swells of 1.5 metre plus. In fact, the swell could build up to 2 metres by Sunday 3rd of December. But it seems this is a great time for surfing with waves of 1.5m off popular Gold Coast beaches. We hope to get back on track with regular ocean freediving by the weekend of 8th, 9th and 10th of December. Nevertheless all our courses are continuing as per normal. 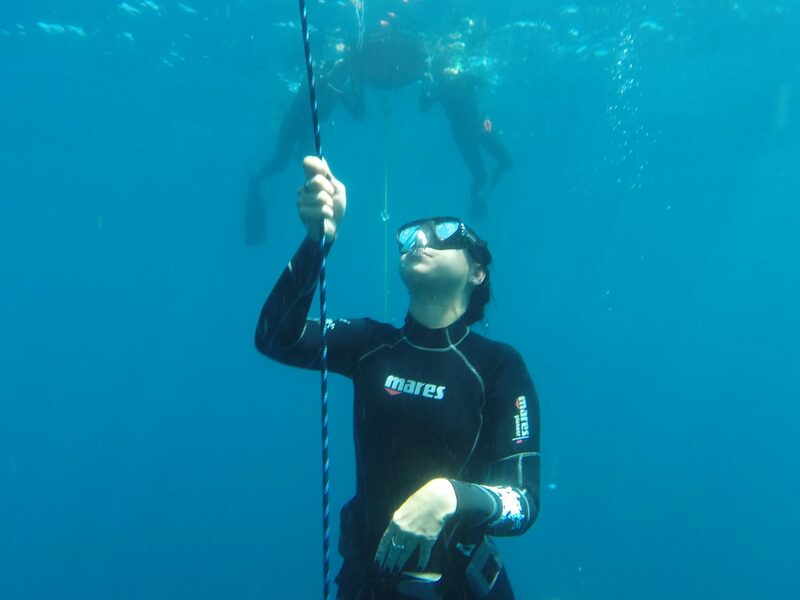 If for some reason you have enrolled in a freediving course which includes the the best part of freediving – fun ocean diving, then we will make this available to you as soon as weather conditions improve for ocean freediving. Rougher conditions expected for the weekend so we gave our students the option of ocean diving on the Friday. Only 2 nautical miles offshore we had warmer waters with 24 degrees water temp and 16m plus visibility. It’s the end of whale season but we saw three hanging about the surface while they were heading south. Sunday ocean diving was cancelled – unfortunately – as it was well chopped out with all white caps so Friday was definitely THE day. Well done to the ‘Big B’ for his personal bests on the float. We were 3 nautical miles offshore. 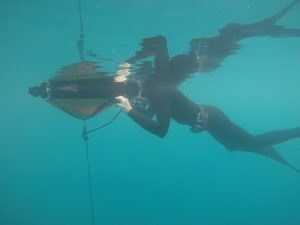 Despite rains during the week and northerly winds, we had lovely 16+ meters visibility. Whales were still hanging around as they continue to head south. High tide at 1230. Winds came up, as predicted so nice to start the day early. Water temp was a fresh 22.9 reading on the sounder but Clint’s watch was registering 24 degrees on the surface. Well, the sun was out shedding plenty of warmth. Best place on the Gold Coast to be, as always. Quiet out there. Just a pack of freedivers exploring the depths and listening to the whales singing out the last of their season. Zip current until 1130. (When we say ‘no current’ people always seem surprised. That’s right – we mostly have no current – the Gold Coast coastline is almost, essentially, a ‘bay’ – we aren’t the furthest eastern coastal area in Australia so we have plenty of ocean to be in without us being in the EAC (East Oz Current). North westerly winds changed the visibility to 10m plus+ on the Sunday. The westerlies flattened out swell. Some chop on the seas 2 nautical miles offshore but nothing to distract from the quality diving and breathups. No whales sighted but they, as usual, were heard loud and clear on the line. Water temperature was 1 degree warmer at 20.4 degrees. Visibility offshore is phenomenal at 25m + plus. Water temperature was 19.4 degress Celcius. No current. Smooth seas. Light chop later in the day. Perfect training conditions. Perfect conditions for beginner freedivers and advanced training freedivers. Two whales sighted and a pod of dolphins but the highlight was the magnificent blue water and visibility. It was peaceful out there and totally conducive to a peaceful freediving mindset. Perfect conditions today. 18m+ visibility at the 40m contour. A couple of whales passed by us (when we were on the boat). Flat seas for the whole morning. Water temp was a fresh 19 degrees Celcius. Lovely dive conditions on the weekend for the AIDA 2 Ocean Freediver Course and open water sessions for certified freedivers. Plenty of winter sun, 15m + plus visibility and a curious dolphin popped on over. Here we all were – 2nm offshore on a perfect Gold Coast Sunday day. Congratulations to Andre, from Brazil, for his 3mins 40sec breath hold during the AIDA 2 pool session and 20m depth dives. Thank you everybody for joining us on the Sunday and enjoying the Surfers Paradise, Gold Coast, offshore. No whales seen Sunday, but our divers assure us they were sung to at depth. Mmm no whales sighted today. Dredging happening close to the coastline and, perhaps, impacting on visibility today. Current at the 35m contour. Visibility was about 10m. Closer in, no current but the visibility was less than 10m. Water temperature was 21 degrees Celcius. Storms were predicted to happen during the morning or afternoon – but our morning opened up to rays of sunshine and we had the winter sun on our backs all day which was … bloody lovely. Rare sighting of a seabird from east Asia – the black tailed gull. Yes, the divers on float 2 had a very close inspection. It happily placed itself on the float. That was unexpected. But, then again, I don’t think it was expecting us out there floating around either. So we kind of just studied each other. 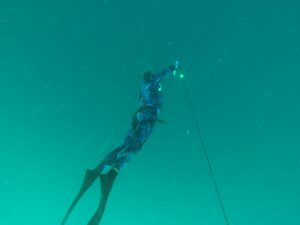 The experience, like most of them in freediving, was… unique. Very pleasant conditions in the water and on board today due to little breeze. We did dive in an outgoing tide but, even still, visibility was fairly poor at less than 10m at the 42m contour – even less so much closer in (less than 5m on a 20m contour). Little breeze on the water so just winter sun, sun, sun. Dolphins and whales – a plenty. Green turtle sighting. Hammerhead passed on through. Well, such is the sea when it’s little over 0.5m and you can see for miles. Still 22 degrees water temperature outside which is warmer than inside for divers who dive the Seaway. You’ll notice… it’s always warmer outside. About 115 boats counted – simply whale watching and doing the usual Sunday outing but we kept clear of the crowds. This always makes for pleasant diving. Saturday…our on board lookout counted 30 whales moving north so things were pretty noisy under the water. Visibility at the 42m was 12m plus and then at the 20m it cleared up to see the bottom. Diving outside on a low tide. Cool breeze on board so it was warmer to stay in the water. Very comfortable breath ups in water. Just stillness on the ocean. 22 degrees. Expecting no winds tomorrow and less sea state. Seas were under 1m. 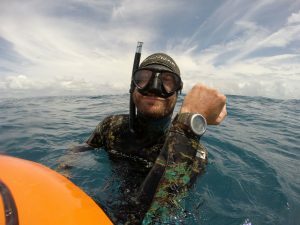 Freediving courses weekend dive report? Water visibility’s cleaning up 2 nautical miles offshore after the rains with a 12 metres plus+. Water temperature was a fresh 22 degrees and was warmer in the water than out. Blue, blue skies. Zero current at the 30m contour made for some very pleasant diving. Rug up in your winter warmers with a steamer under your 5mm scuba suit, if you only have a scuba suit. For males, 3.5mm Cressi Apnea suits are handling the cooler waters at the moment with only a lava core vest underneath. Condition’s report? 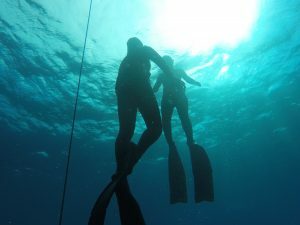 20 metres plus+ for visibility and sun, sun and more sunshine for this Ocean Freediving Course (AIDA 2 Level). We were 2 nautical miles offshore on the Gold Coast on this fine Sunday. Zero current and unaffected by tides (neap) made for some very easy conditions and some lengthy dive sessions. Complimentary 5mm hoods for our divers are making for toasty winter warmers – albeit, only 2 of our students felt the need to wear them (water temp 22 degrees celcius). Whale watching boats were out for sight seeing but no whales that we could hear and if they were around we always know about it. The deeper we go, the louder their song. Well, no singing today from whales but everything else was worth singing about. Today was cloudy all day with intermittent rain. Nevertheless we had 12 metres water visibility some 2 kilometres offshore at the 20 metre depth contour. No current so a very long and nice window to do skills – no rushing. We also did some diving off Wavebreak Island at the top of the tide to finish off skills (swell did pick up outside). It was surprisingly good for this overcast day to finish off at Wavebreak Island and after recent rains with about 7 metres water visibility (Wavebreak Island). Water temperatures were around 22 degrees centigrade. Fortunately, we are offering 5mm hoods as a special throughout winter and all our freedivers were toasty warm in their 5mm wetsuits and 5mm hoods. Don’t let a bit of overcast weather put you off ocean diving or a freediving course – there’s a stillness that comes with rainy days on the water – boat traffic stays away, allowing for peaceful dives at Wavebreak and, well, offshore diving is generally always peaceful – more like mid-week traffic – but less boats on the water is always synonymous with wildlife visits and a calmer, quieter environment all round. 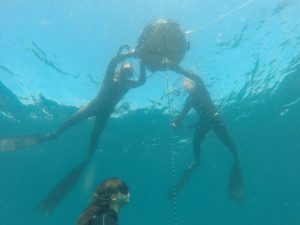 Freediving Course and the Advanced Ocean Freediving Course. On the 30/4/17 in about 30 metres of water we had 15 metres plus water visibility. On the 1/5/17 we went further out (6 to 7 kilometres) in 40 metres depth of water. I think we were close to 24 metres visibility. The picture of the two freedivers at the yellow float shown here was taken over 5 metres away and gives a good indication of the great water visibility and clarity for freediving in winter on the Gold Coast when you go well offshore in our dedicated freediving boat. The 1st May was better as the wind had dropped and there was literally no current so perfect conditions for advanced diving. Water temperature is now closer to 23 degrees centigrade requiring a good 5mm scuba wetsuit or a good 3mm freediving wetsuit with a hood. We dived over the Easter weekend and water visibility is recovering from Cyclone Debbie. 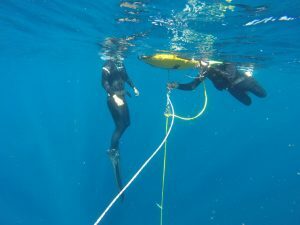 We were getting approximately 13 metres visibility and 24 degrees centigrade water temperatures. However, at depths of 35 metres the visibility had decreased to about 5 metres due to settlement of particles in the water. At that depth, who cares? Freefalling into oblivion from well before this depth and just enjoying the ride. and these conditions were ideal in helping them achieve personal bests. As usual the dive report in the Gold Coast Bulletin the day before suggested 10 metres visibility. Perhaps. 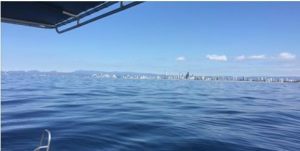 But we seek out the best visibility for our students and have a choice of locations off the Gold Coast where currents are minimal. Some photos from the day are on Facebook Freediving Gold Coast. Thanks to our boat captain Cristy in getting the conditions right for learning to freedive. Very sweet conditions. This is the Gold Coast. 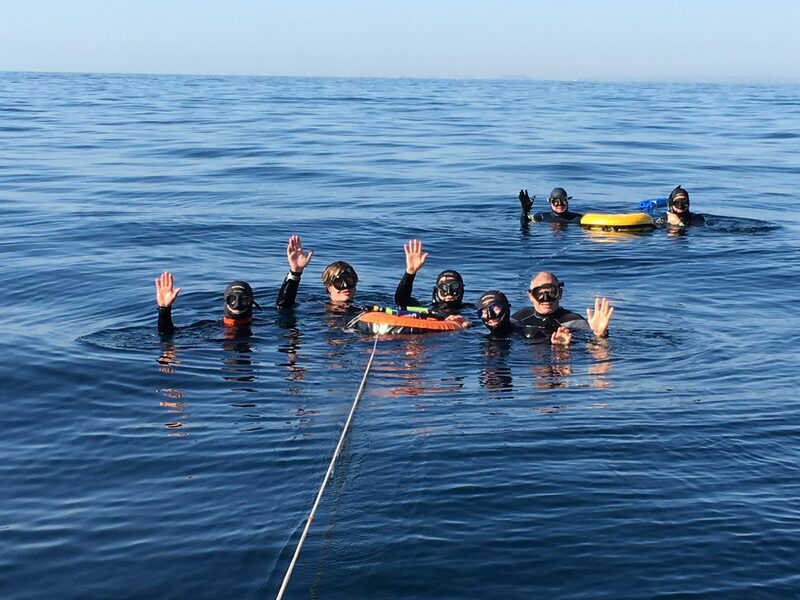 We had close to the best conditions possible for our Open Water Freediver Course today (see picture of 7 freedivers on the two floats). Surface temperature was 26.7 degrees Celsius. We had in excess of 16 metres visibility looking down from the float. Visibility and water temperature decreased at the 20 metre mark. There was little wind with a swell of 0.8 metres – essentially flat as the picture shows. A full dive report and pictures are on our Facebook Page for Freediving Gold Coast.